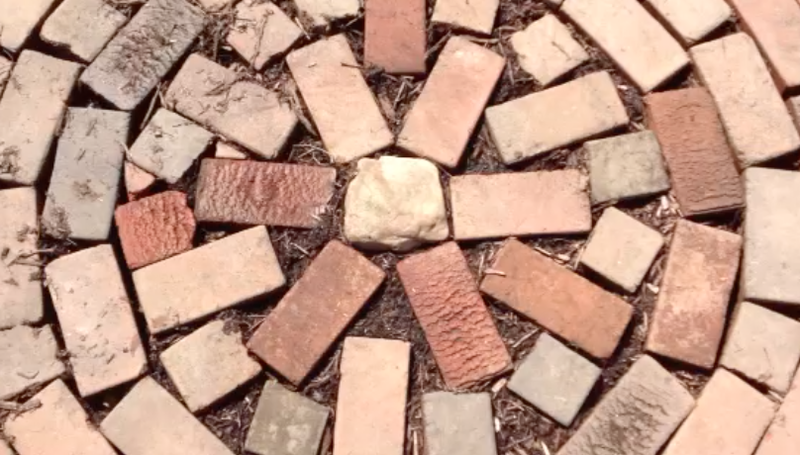 The process of lining the walkways with layers of newspaper appears to be working. This post describes the beginning. What I hadn’t expected was the tedious process of laying the sections out so they form a uniform base. 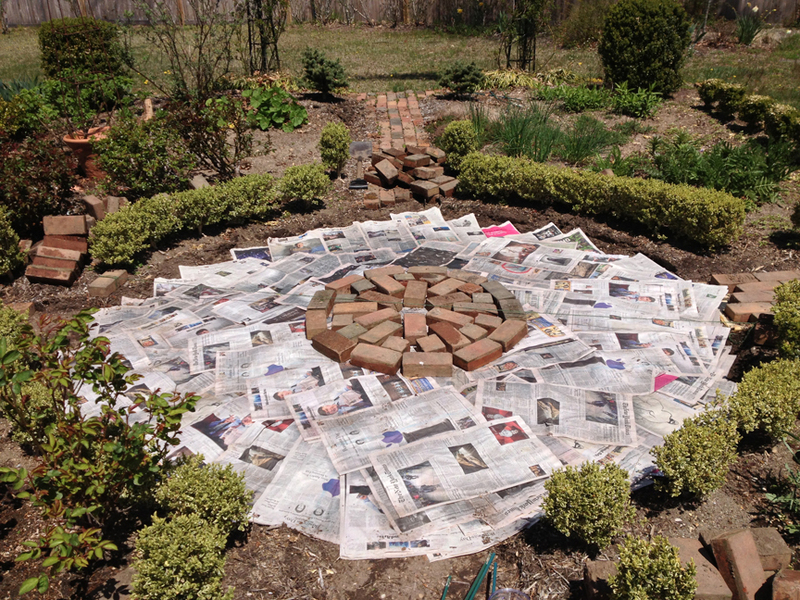 BTW, re-doing the south walk, I realized why this works: the newspaper becomes a layer of paper mache! What I also hadn’t anticipated is the review of world events that go into the mindless layering. For example, on the south walk underneath the brick are layers of stories on the Boston bombers, Alec Baldwin’s media blitz for “Orphans,” the 17-day survivor of the Bangladesh building collapse, and most recently, the little boy fleeing the carnage of another bombing in Kabul. I have no desire to join the world-is-moving-so-fast / TMI whining crowd, but I am aware of the impact of reviewing these stories, in the garden, and slowly. My heart goes out to the scared children and those who suffer. While China is on a debt binge and Google and Apple continue their megalithic climbs for industry dominance, I quietly layer the news to buffer weeds and level my walkways. But not without sending out heartfelt wishes to those who cry and ache for an easier life. Thanks, J-J, for helping me gather the news. 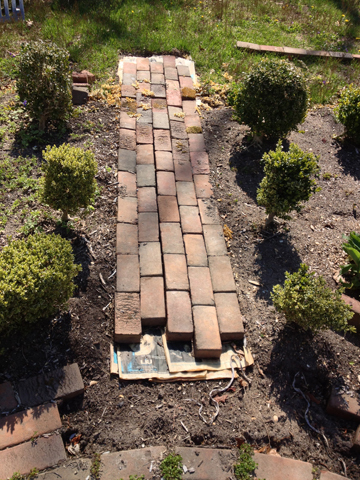 Moving the brick … again. 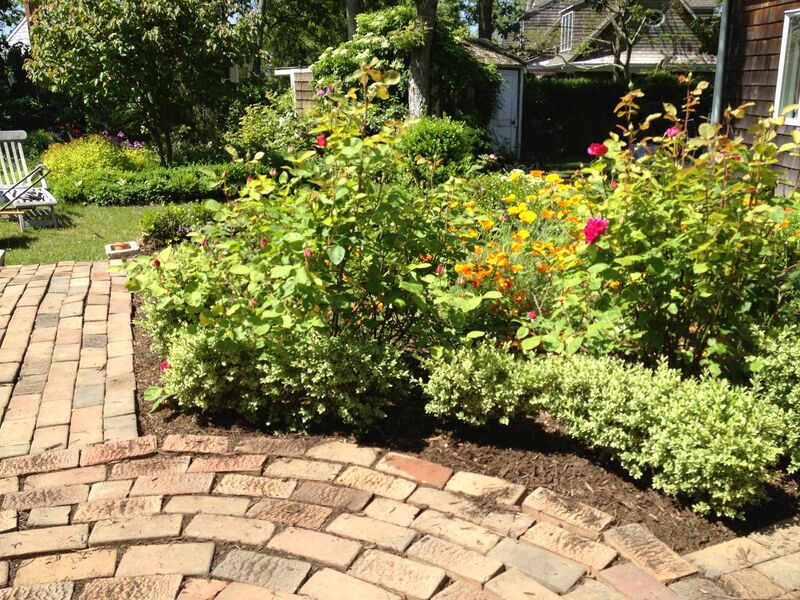 Every spring I’m torn between nicely manicured beds, filling the beds with plants and keeping the walkways weed-free. 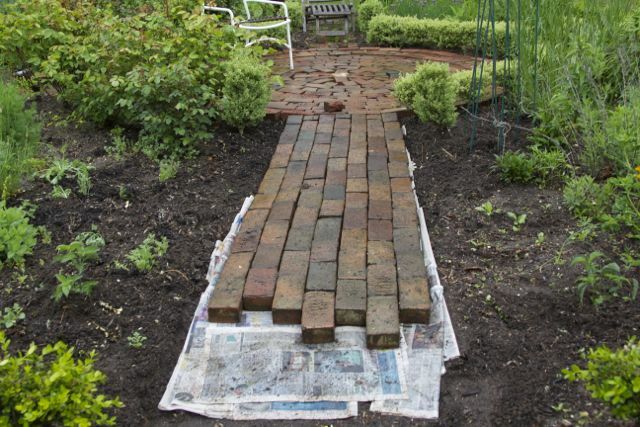 While looking online for ideas for tomato supports, I ran across instructions for building raised beds that suggested using newspapers to line the bottoms as a decomposable way to keep weeds away. Aha! I thought. 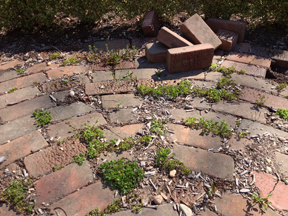 See how the mulch and dirt, over time, drift from the beds to the bricks? It adds to the weed problem. 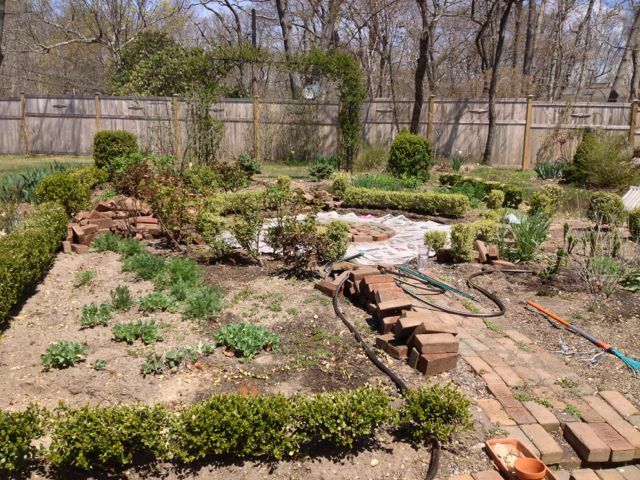 What I’ve done for a few springs is go through each section, brick by brick, with a butter knife to de-weed everything. A full rotation twice a summer is required, and this takes hours and hours of labor. Not good. Determined to keep at it, I thought instead of re-doing the south walk section, I would start with the circle and then build out from there. Next, I started laying out the paper. Note to self: don’t do this on a windy day! There was only a slight breeze, but strong enough to have all those pages flying, so I dragged the water out and wet the paper as I layered it from the center and extending out. 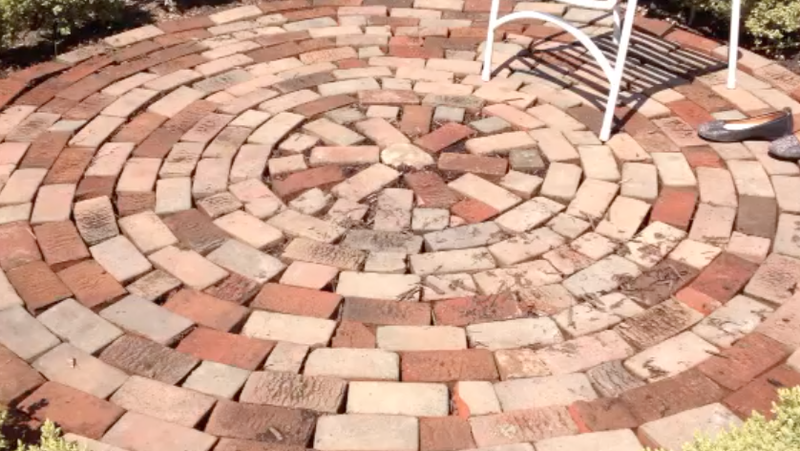 Then, using the string/two-brick tool, I found the center point and positioned the bricks to start the circle. This was kind of scary. Why? Because being in the middle of a mess like this, one realizes that you can’t go backwards and forward is the only way to proceed. Plus, I wasn’t sure this was really going to work! I added a new tool – not sure what it is called. I think of it as a prospector’s tool: kind of like a pointy hammer on one side of the head and a prying kind of thing on the other side. I quickly ran out of half bricks and used the prospector to break whole bricks in half. 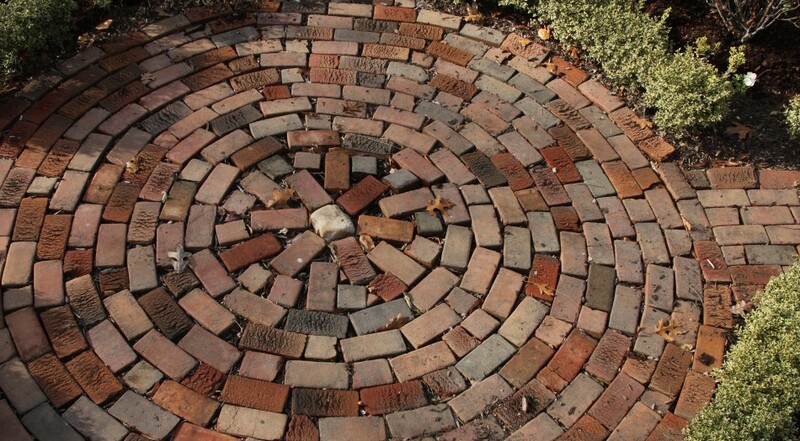 I found that with a quick bang on the smooth side of the brick, it would separate with one good whack! 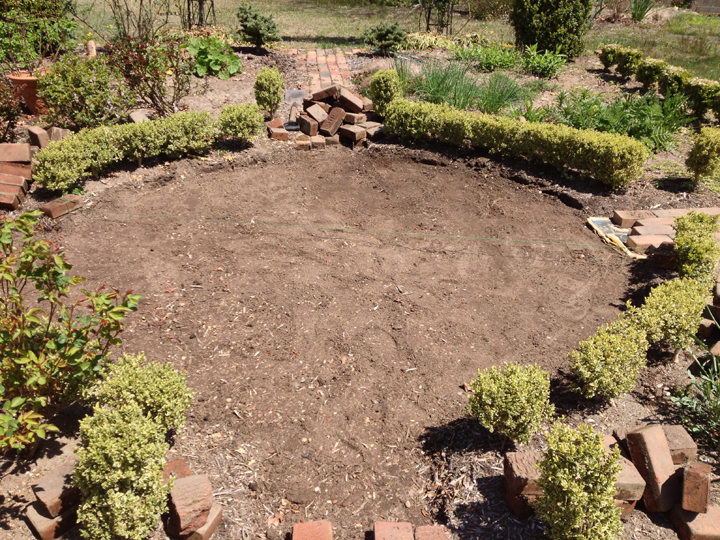 So after filling in the center, I started lining it with concentric circles. When I got within 3 or 4 layers of the beds, I noted the level dropping off. I had two bags of Hampton’s Estate mulch left over from last year, and gave these outer edges some nice beds of mulch, saving about a third of one back to fill the center. This helped raised the level. And here’s how it turned out! Pretty, right! Loving it. Loving the center too.